First making a name for himself on the British jazz scene in '91 as a member of the high profile young Turks the Jazz Warriors, Tony Kofi went on to guest with a wide variety of artists during the first half of the '90sfrom the David Murray Big Band, Jazz Jamaica and Eddie Henderson to Queen Latifah and Salt-N-Pepabefore joining the Township Express Orchestra and Tim Richards' Great Spirit, both of which he continues to play with. He is a red blooded and muscular soloist in whom Charlie Parker's wild, unruly tone is often writ enjoyably large, and who is also capable of moments of delicate, tender lyricism. His first horn is the alto, but he also plays soprano and an earthy yet fleet fingered baritone (more Leo Parker than Gerry Mulligan). Incrediblyand rather shamingly for the British record businessthis is Kofi's first release as leader, a full thirteen years after his emergence with the Warriors. But that's another story, and an old one. The Tony Kofi Quartet, the members of which began woodshedding the Thelonious Monk songbook together in '00, debuted in fall '03 at the London Jazz Festival with a marathon six hour set in which they played every one of Monk's seventy known written compositions. The Quartet is part of the larger Monk Liberation Front ensembleco-led by Kofi, pianist Jonathan Gee and composer Philip Clarkdedicated to bringing Monk's oeuvre to new audiences while also commissioning original work informed by Monk's legacy and spirit. 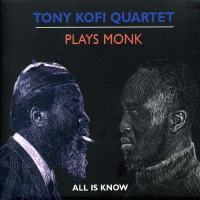 Not only the first own-name album for Tony Kofi, Plays Monk (All Is Know) is also the first release on Proper Records' contemporary Specific Jazz imprintand it's an auspicious, hugely enjoyable and thoroughly convincing new beginning on both fronts. Track Listing: Boo Boo's Birthday; Ugly Beauty; Trinkle Tinkle; Ruby My Dear; Brilliant Corners; Comin' On The Hudson; We See; Crepuscule With Nellie; Teo; Misterioso; Gallop's Gallop; Light Blue; Think Of One; Monk's Mood. Personnel: Tony Kofi, alto, soprano and baritone saxes; Jonathan Gee, piano; Ben Hazleton, bass; Winston Clifford, drums; Orphy Robinson, marimba; Reiad Chibah, viola; Andrew Joyce, cello; Madeleine Easton, violin.